Having a background in analogue and hand-applied photography, Ualani Davis and Brandon Ng were committed to utilizing the cyanotype technique for this project as a way of introducing and giving museum visitors the opportunity to experience a different method of photography. The cyanotype process is one of the simplest methods of photography; requiring only UV or sunlight to create exposures and water to develop and fix the image, cyanotypes are perfect as an outdoor art project. However, to make the whole process accessible to museum visitors, Davis and Ng decided to construct a temporary darkroom on Spalding House’s outdoor Surface Gallery (formerly a tennis court). Made out of PVC pipes, a couple hundred yards of duct tape, and tarp and illuminated by a single 15W incandescent light bulb, Davis and Ng were able to sensitize and dry their swaths of cotton fabric on the museum premises, allowing visitors to the museum to witness the creation of Blueprint from beginning to end. Visitors to the museum were encouraged to participate by creating theirown cyanotype photograms on the pre-coated fabric. They in turn produced images representing the physical description of the museum by collecting materials found on the premises or became the subjects of their own self-portraits by laying on the fabric. 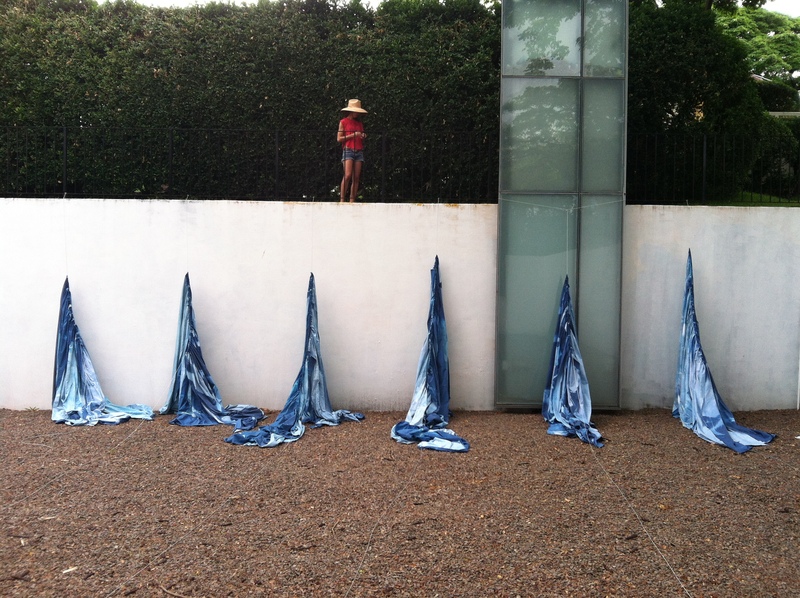 After an exposure of 15-20 minutes, the artists would immediately process the fabric in a bath of water, allowing each visitor to see their finished cyanotype. During the 6-week residency, nearly 50 large-scale cyanotypes were created and strung across the Surface Gallery to create a new space that interacted with the wind, light, and shadows of the environment.